I headed to Dublin on Monday; an overcast or dull day as they call it. 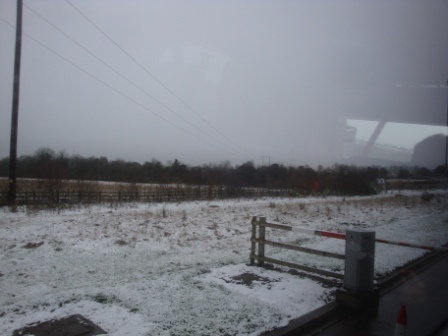 As the bus approached the toll booth near Maynooth, I looked up from the book I was reading to find a dusting of snow covering the ground. It’s been bitterly cold this past week. Of course, like deciding whether a dish is spicy hot or not, cold is relative. Temperatures hovering in the single digits (Centigrade – low to mid 30’s Fahrenheit), my family back in Wisconsin would think are a heat wave. They currently have temperatures hovering in the single digits Fahrenheit. However, for those like me that left that frozen tundra living many, many years ago, I just have no tolerance for such cold, and even less for the fluffy white stuff. To me, that tiny, four letter word is like a curse – it should never be spoken aloud lest it manifest. People who don’t live in climates that get large accumulations of snow admire the frozen white precipitation. Admittedly, it can be pretty, for very short periods of time. But if you’ve ever had to live in it, shovel your weight ten times over in it on a frequent basis, climb over snow banks taller than yourself to get to school, dig your car out of it so you can drive to work or back home, all the while bundled up to look like the snowmen children are so fond of building, you know it’s not all ooh’s, aah’s, and fairy dust. Now this was only a light dusting, which disappeared the closer I came to the City Center; reappearing as a little over an inch near Blanchardstown where I was headed. It was slowly on its way to melting as the temperatures kept themselves above freezing during the day. Great Britain bore the brunt of the winter storm, this time, for which I’m thankful. When I left on Wednesday, there was still the odd patch, but most of it had disappeared as I believe it should – quickly and without causing major chaos. If the only time I ever saw snow again was from a distance or on a picture postcard, I’d be perfectly content; however, I suspect it puts in the periodic appearance to remind those of us trying to escape such weather, how good we have it most of the time. P.S. 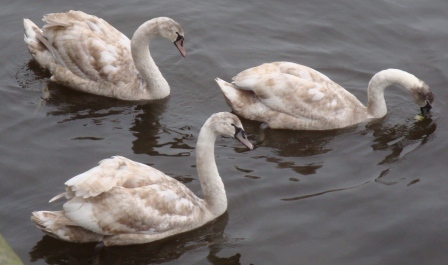 – I’d thought the Galway cygnets had all changed by now since I hadn’t seen them in two months, but it appears only the lone orphan has made the full transition. This photo was taken on January 15th. we too had a light dusting, and growing up in the land of snow now removed these many many moons… i like to have it (snow) somewhere i can go to and leave it there when i leave…*wink* i love the photos you post… hopefully Blanchardstown will be warmer for your likings! I agree – snow is nice to look at but not so much to live in.